After the first international race in Carnac, now the first national race to measure ourselves against the other Belgian teams. In total there were 2 titles to win this weekend. 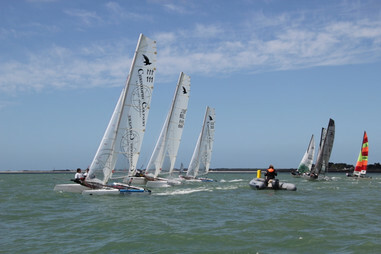 The title of Belgian Champion buoy racing and the title Belgian Champion long distance. Buoy racing was held on Thursday and Saturday, on Friday a long distance race was foreseen. 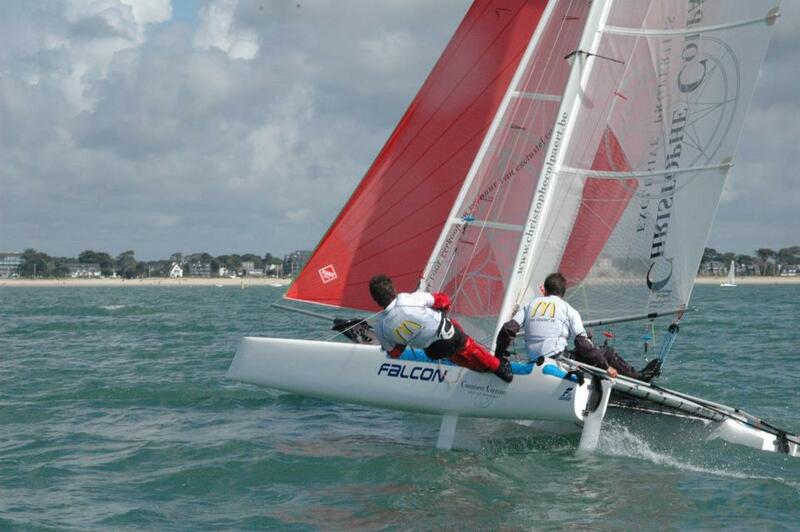 Show sailing for the sponsor :-) (Christophe Colpaert, Falcon, RBSC/McDonalds). After the KYC race last weekend we knew what to expect and made sure we were well rested to start the weekend. 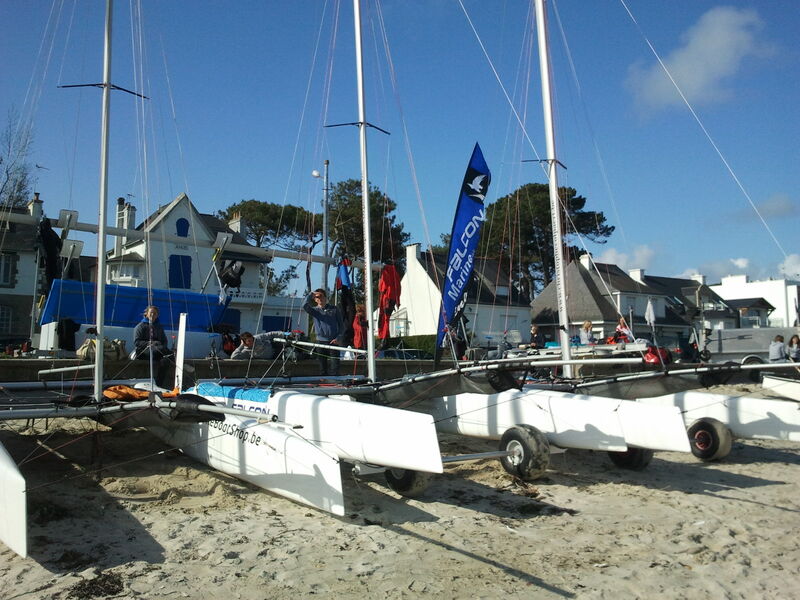 The meteo for the weekend predicted light and shifty winds, so we prepped for some long and nervous racing. 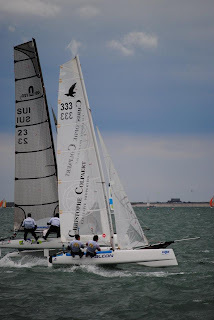 On the first day 3 races were sailed in, as predicted, light and shifty winds. A lot of current on top of that made tactics extremely important but difficult at the same time. We were immediately in the groove and got a good start with about 5 teams in the first race. Throughout the race we managed to get the correct shifts and the 5 got away from the pack. 4 F16 of which 3 Falcons and an F18. 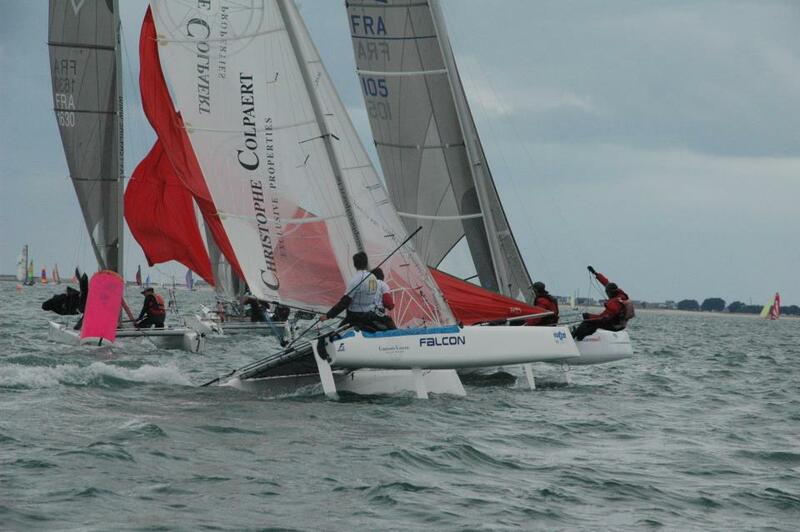 In the 3rd round Falcon BEL 222 and the F18 with Anouk & Gilles managed to get away and they finished 1st and 2nd. We were chasing them closely behind but hit a bouy. After the penalty we were still comfortable in 3rd position, but too far away to fight for 1st or 2nd place. Falcon BEL 111 was fighting for 4th or 5th and had to settle with 5th in this race, but well in front of the other F18 and the F20. By the end of the day, after 3 races, we managed to be in 3rd position dues to 2 OCS of other teams. BEL 111 in first position. The performance of our youth teams has improved a lot thanks to the intensive training in the RBSC/McDonalds youth team. Less competitors during the long distance race or changed configurations. Friday was not an off day for everyone, meaning in our case only 2 Falcons at the start. The race started light again in about 5 to 7 knots, but surprisingly the wind picked up to about 15 knots gusting to more after about an hour into the race. Our start wasn't good and we were 8th at the upwind mark. After that a downwind run. We managed to catch the first shifts of the building wind and got into 6th at the second mark, less than a minute behind 3 F18, the F20 and the second Falcon. A long 2 sail reach led us through a gate and 2 buoys. First boats we catched up with were an F18 and a Falcon. 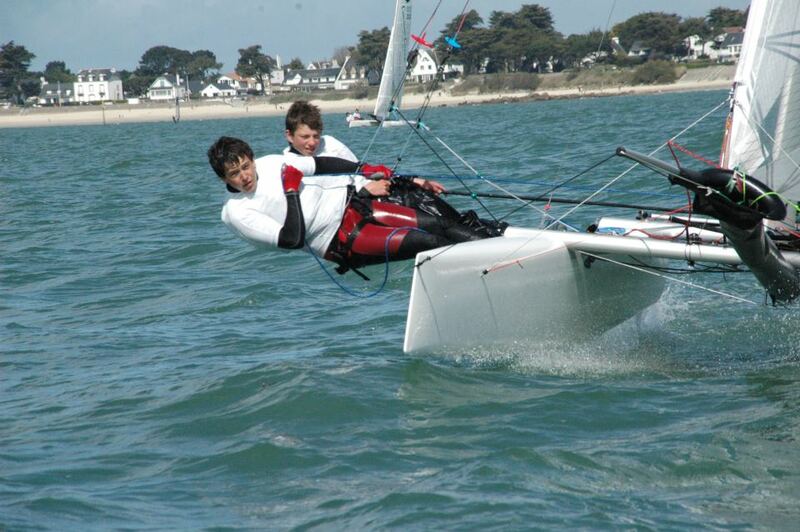 Philip sailed with his dad on this occassion and was steering and sheeting. Not used to this we over took him on the reach. About 1,5 hours into the race we tacked sailing upwind to the coast again. The last races our upwind speed has been awesome and here again we got the trim just right. Building speed in every gust we managed to overtake an F18 leaving just an F18 and F20 in front of us. Back at the coast we had to return to the starting area on a spin reach to start our second run. Double trapping in these windy and gusty conditions made us feel our boat is 2 feet shorter than the 18. We lowered the risk and single trapped only. The brothers Proot over took us again so we were in 4th by the time we finished the first round. After about 2 hours into the race we started for the second time the long reach which had become almost an upwind leg. The wind had now clearly built to about 15 knots gusting to 20 and we were able to depower the best giving us the best performance in speed. We overtook the brothers Proot again and went chasing the other 2 boats in front of us. In the last upwind leg we almost caught up with the F18 and F20 and were about 1 minute behind. For the final spinnaker reach the wind was even too much for the F18 to twin trap meaning we didn't loose ground anymore here. Finished third and a rating helping us getting 1st place meant we became Belgian Champions long distance, with Spilleboudt (Wildcat F18) in second, Philip and his dad in third and Proot in 4th. Final day of the Belgian Nationals. With low winds again, down to 5 knots, the race officer made the call to go out and race. Happy to be able to drop our worst score but at the same time worrying if we would be able to get some quality racing in. Eventually 2 races were finished in conditions that were sailable. The finishing order of the 2 final races confirmed the performance of the teams of the first day so the actual scoring didn't change too much. 1st Philip&Gaetan (Falcon), 2nd Proot (Wildcat), 3rd Arnout&Klaas (Falcon), 4th us and we were first mixed team! Finally big respect to all the youths, coaches and parents that joined the event in all classes! And ofcourse a big thanks to SYCOD for the great races! All winners below. What a great month May has been to us so far! 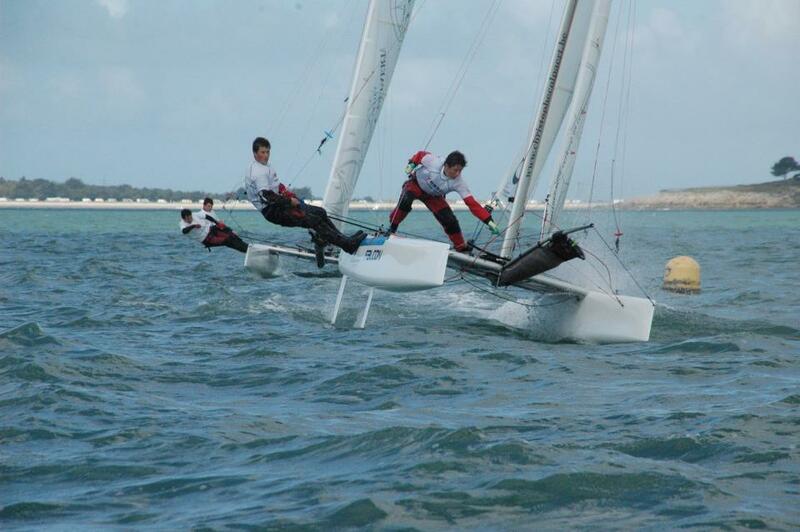 Great sailing and great results for us and the youths. 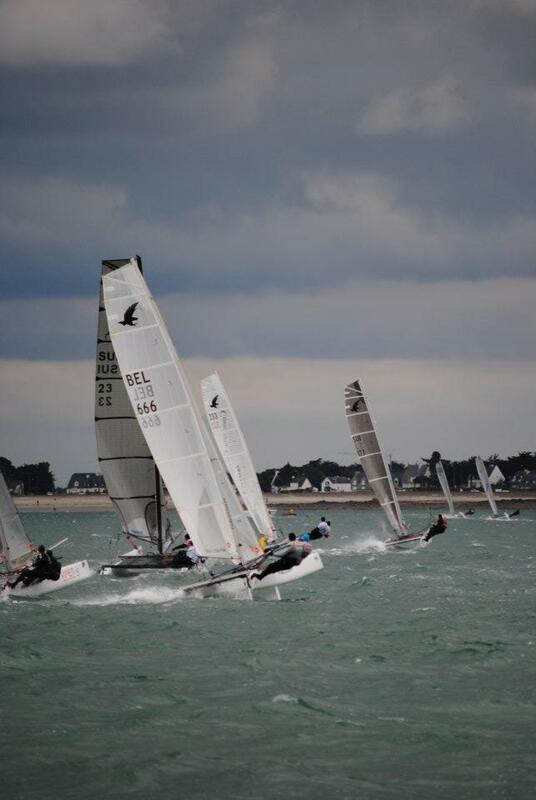 The month started in Carnac, France where a large group of Belgian youth teams from VVW/Protest and RBSC/McDonalds attended the racing including 2 teams on Falcons. The weekend after we got some training in to prepare for 3 weekends of racing in a row. Last weekend we sailed the KYC race in Koksijde. Only one day of racing in Koksijde in windy conditions, dying towards the evening. We managed to rig our spinnaker wrong making us return to the beach and missing the first race. Luckily we got in 4 races so we could drop one! As in Carnac also here a lot of youths showed up giving the adults a run for their money. And in difficult conditions (big waves and dying wind) Philip&Gaetan managed to get into first position by the end of the day! BEL 111 heading for first place! We would have loved to take some revenge the next day but all we got was sun (which wasn't too bad either :-) ). 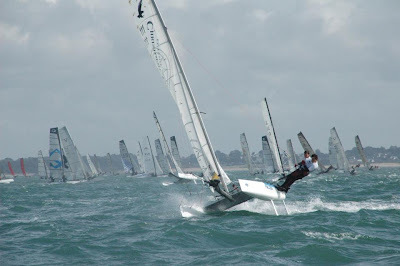 Eurocat is the first big event in Europe and is not to be missed. Unfortunately this year we really did not have any luck with the weather conditions. Of the 4 possible days of racing, only 2 days went trough. 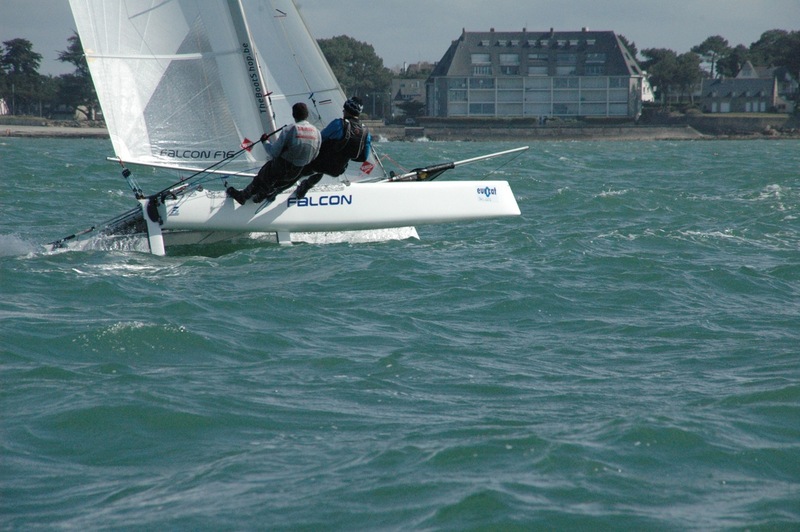 On Saturday the C1 class sailed 3 races and on Tuesday the long distance raid was scheduled. We arrived early to practice and train together with the youth teams. Next to the 3 Belgian teams there was also a Swiss and French team competing. First day of sailing was on Friday and was a training day with Sebbe Godefroid. 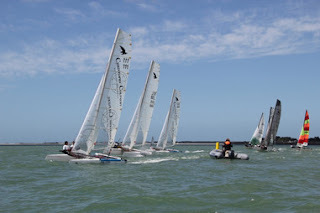 Focus was on practising starts as in a 60 boat fleet getting a good start is extremely important. While training we found out that winter had not done us any good :-)! By the end of the day we did some small races in nice and sunny conditions. Saturday we went out at 13h to go racing around the buoys. It took the race committee some time to get the (difficult) course into place, but eventually we were able to sail 3 races in great conditions. Wind built from 15 knots to about 20 knots for the last race. Little to no waves made for some very fast and cool spinnaker runs regularly reaching 18 knots of speed. Race 1 can be considered a practice race for us... :-). Bad start and trying to find our way around the inner/outer loop course. Our first race didn't seem to end, especially because we had to finish 3 times to do it right! Shame on us! Also for the youths and Swiss it was a great day! One team finishing continuously in the top 10, the other youth team and Swiss finishing within the first 16 boats. Hot at the top mark! Heavy winds made Sunday and Monday a day for 'tuning' by the Falcon teams. Some visiting of the surroundings and kart racing filled the day. Finally some racing again. The race committee decided to to a short version of the raid instead of a second day of buoy racing. I switched Kathleen for Maarten who crewed with me on the raid. Conditions about 15 knots with some lulls towards the end of the race. At 10h30 we took off for a bit over 2 hours of racing with 300 other boats. We got lost in the middle of the pack at the start giving us no opportunity to sail in clean air. After some 5 or 10 minutes we managed to get clear and could start catching up. Maarten did the mainsheet and I needed to get used to this. Especially in the reaching parts (about a third of the race was 2 sail reaching) I needed to grow confidence in Maarten doing the main while I beared away in the gusts to gain speed and sail deeper. But it paid. Having 2 hands on the main in these reaching parts is definately faster. Next to the reaching parts the first part of the race served us with a long upwind leg. We got the boat in the groove sailing faster and higher then most of the boats around us. We have been working on mast settings lately and copied this to the other Falcons racing. All of them had the same experience the boat was sailing high and fast! Great improvement. The second part of the race was a downwind with some reaching to finish off with. On the spinnaker run the wind started to go down a bit and we didn't anticipate fast enough to this. Some of the boats we passed on the upwind overtook us, luckily only a couple and not all of them :-) ! Again great results with the first Falcon team finishing 3rd F16 after 2 Olympic level teams! Late, but we decided to drive back yesterday instead of today. Mainly to be able to write this lovely report, but also because we like our bed more than the one at the hotel! Next up are some races at the West Coast with the Belgian Championship as most important one!